The term “katydid” originated in North America. 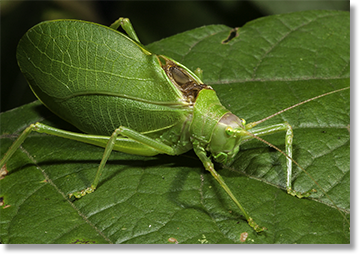 When early Americans beheld the raucous ch-ch-ch of Common True Katydids (Pterophylla camellifolia),they were compelled to make the sound part of their folklore. Several tales continue to circulate and our favorite goes like this: There was a woman named Katy who fell in love with a handsome young man, but she was scorned, and the man married another. Soon after, the couple was found dead, poisoned in their beds. No person saw what happened, but perhaps the bugs were watching, and on hot summer nights, they shout from the trees and tell us who-dunnit: katy-did, katy-did, katydid! 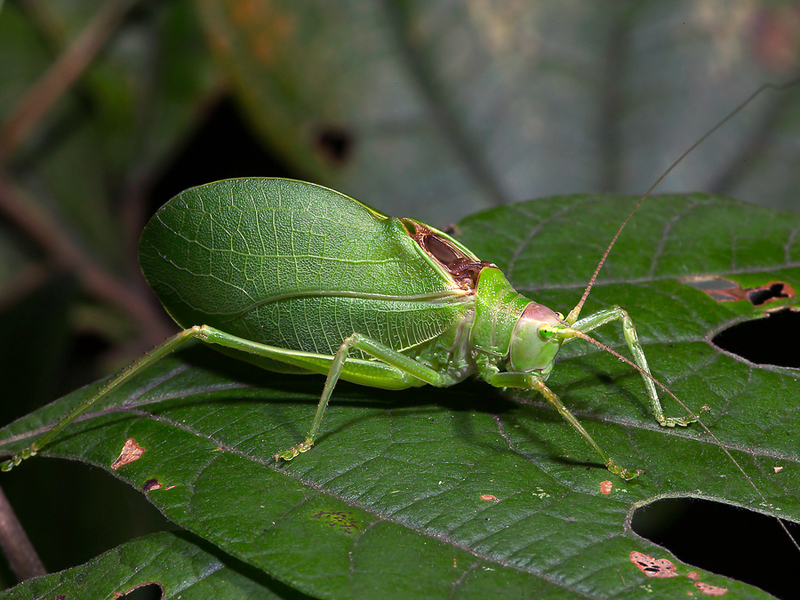 The true katydids are an extremely diverse group, with over one thousand species found worldwide. Yet only four species are found in North America, represented by three genera. 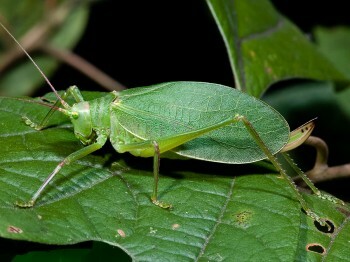 Of these, the Common True Katydid — the quintessential noisy katydid with which most of us are familiar — is the only wide-ranging species in the East, and the only species covered in this guide. The Common True Katydid is built like a tank, with cupped wings that give it a formidable appearance. Although they do not bite, they often squawk loudly when handled, puffing themselves up by holding their forewings away from their abdomen. Their fore-wings are well developed, but true katydids are apparently unable to fly, lacking hind-wings. At most, when disturbed, they may leap from a leafy perch and flutter to the ground, where they walk to nearby tree trunks and climb back into the canopy. Although they spend most of their life high in trees, they often gather in dense choruses during the breeding season, and individuals may sometimes be encountered walking across roads as they move toward noisy congregations. Rarely do males call from shrubs or small trees. Females lay eggs in crevices in the bark or in soft plant tissue. The eggs hatch in the spring, and the nymphs feed on foliage until they reach adulthood, most never leaving the shelter of the canopy, and possibly the tree in which they were born. Initially a person may notice fewer discount montelukast new acne lesions..
One to three raspy ch notes depending on location.